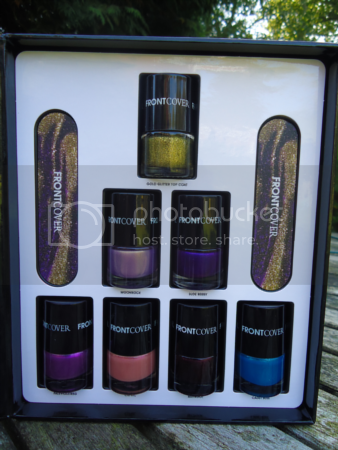 I was in my local Boots the other day and stumbled across Frontcover Finger Print, a pretty boxed collection of seven metallic nail polishes, plus a buffer and a nail file. The colours looked intriguing, so I bought it as an early Christmas to myself. I'd just like to say how happy I am that I did! The polishes come in a box with a magazine-style cover. When you open the flap you can see the polishes on one side, and some advice about applying nail polish on the other. It also gives you some ideas for being more creative with your polishes, such as a funky French and whatnot, which is great for people who perhaps normally just do a standard manicure but want to branch out. No matter how cool the packaging is, what really counts are the nail polishes themselves. There are seven colours, including a glittery gold top coat that can also be worn alone. The formula on these was very good, I was pleasantly surprised. I haven't used them on my nails yet but I imagine with a decent top coat they should last a good few days. My only complaint is that because the bottles of polish are quite small, the brushes are really short and it makes them a little difficult to wield. Best of all about this set is the price - it's £14, which translates as only £2 per nail polish. For such lovely and unusual colours, I think that's a bit of a bargain. It's perfect as a Christmas present - to yourself or someone else! I really can't recommend it enough.